October 6-15 is Fire Safety Week this year. So, we invited some local firefighters to storytime! They are annual visitors to storytime and great friends of the library. They even brought a fire truck with them so kids could see a truck up close in front of the library. When firefighters come to story time, I read, sing, play, and talk with the kids and their families for the first 20-25 minutes. This gives families a chance to get settled and allows the firefighters to concentrate on the demonstration part of storytime while I get to read stories and sing with the kids! Instead of starting with the song cube this week, we began by talking about fire safety, where fires should be and shouldn’t be, and what firefighters do. After finding out that firefighters were coming to story time, many of the kids became pretty wiggly. That meant it was time for some hokey pokey, firefighter style! Put your helmet in, and shake it all about. There are many variations on this next song, but I sing this one with the kids before we start reading most books. It settles the kids who find their seats as we sing this. The families know it well and sing along with ease. If you’re ready for a story, clap your hands. Book: Fireman Small by Wong Herbert Yee (Houghton Mifflin, 1994) is an excellent fire safety storytime read. With repeated verses and rhyming text, kids will quickly be able to fill in the blanks when given the opportunity to help read the story. Additionally, the story details the variety of jobs a firefighter does in an accessible context- animals. I had kids stand up for this action rhyme. The kids loved this one! I said it slow enough that the kids could follow and anticipate the actions. A couple of kids could even wink. 1 2 3 4 shhh lets go. As quick as a wink the fire is out. 1 2 3 shhh shhh lets go. 1 2 shhh shhh shhh lets go. 1 shhh shhh shhh shhh lets go. Before kids sat down, I tried the game The Fire Chief Says… which is played like Simon says… This can be a challenging game for preschoolers, so I had the fire chief say only fire related actions (spray the hose, drive the truck, climb the ladder) followed alternately with basic actions (wiggle your toes, clap your hands). Most kids didn’t get the trick of this game so I kept it short. To end on a positive note, I said The Fire Chief says… sit down. They all sat and were ready for the next part of storytime. I had a second book on hand to read if there was emergency call and the firefighters couldn’t come or if they were late. I had just started to read the title of Poinsettia and the Firefighters (Crowell, 1984) by Felicia Bond when the firefighters arrived! With the attention now on the visiting firefighters, I put the book away. The firefighters first talked to the kids about the fire station and then proceeded to get dressed in their gear, one item at a time. This allowed the kids to see the transformation and appreciatethat below the fire gear is a person. Ideally this will help dispel kids’ fears of trusting a firefighter if they are ever in a fire or an emergency. The kids asked good questions and helped the firefighters choose which item to put on next. Families were then invited to go outside and get a tour of the fire truck parked near the front door! Kids were thrilled to hold one of the firehoses, sit in the cab of the fire truck, and try on helmets. The firefighters handed out coloring books, cards, and Halloween bags. The day was pretty windy, so the tour was brief for some little ones. Fortunately, I had planned three activity stations inside where families migrated. Some origami is difficult for families to do in the short craft time, but this origami dog is a perfect introduction! 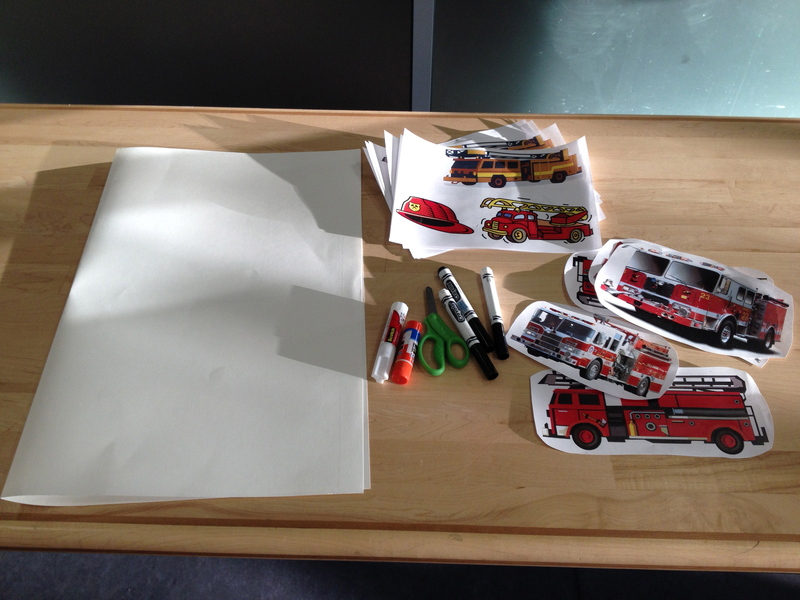 The kids signed and decorated a large thank you card which I’ll deliver to the fire station.